In 1937, Tom Barger left North Dakota and Kathleen, his young bride of two weeks, to seek his fortune as a junior geologist in a remote desert country. Out in the Blue is the story of the people he met and the places he explored in Saudi Arabia - before there was oil. 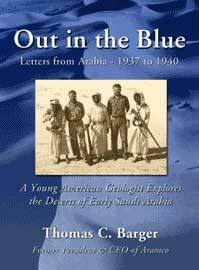 Based on the letters he sent to Kathleen during his first three years in the Kingdom, this book is a fascinating portrait of life in early Arabia as well as a glimpse into the mind and heart of a man who retired thirty-two years later as the President and CEO of Aramco - the largest independent oil producing company in the world. The next day about 10 o’clock we climbed an enormous ‘irq that stretched for miles in either direction to see if we could cross it. The soldiers immediately spotted several camels, grazing a couple of miles away, and shortly thereafter their owner appeared. To our astonishment, he got out a white rag, tied it to his rifle and approached waving the flag of truce. The first person we had met in this desert after a month of traveling, surrendered to us. Salim and Abdul Hadi went out to meet him without their rifles. It turned out that he was a member of the Manahil tribe. He had thought that we were raiders and far too numerous to resist. He gave the soldiers some camel milk and wanted to present us with a gift camel. We thanked him profusely, but explained that we were in a hurry and couldn’t accept such a generous gift. In fact these "gift" camels usually end up costing about twice as much as if you bought one outright. The men keep coming in. We were in Dhahran a few days ago and 23 men arrived that day. We went to town because Jerry had to get another typhoid injection. You see, Molly Brogan, the nurse to whom he spends all his spare time writing, gave him one in Bahrain and also gave him the syringe, needles, and two vials of vaccine for the other two shots. When the time was ripe, I volunteered to administer the injection. First off, I inquired about sterilization, but Jerry said, "Just wipe it off with alcohol." After drawing the vaccine into the syringe, I had some trouble getting all of the air out of it. It is very bad form to shoot air into the bloodstream, because it might stop the heart. Next, after I poked the needle in, I withdrew the plunger to see if any blood appears – if it does, try again. Well, I didn’t get any blood, but I got a lot of air in the syringe. So I tried again and got more air. By the time I got all the air out, I’d lost over half the vaccine. I was willing to quit as we couldn’t get a tight fit between the needle and the syringe, but Jerry greased the syringe with analgesic balm, of all things, and insisted that I try again. I was doubtful about this whole operation and was much relieved when Jerry smashed the last vial of vaccine in trying to break the tip off. So he had to go in to get his shot. The soldiers took advantage of this lunch break to make some bread in the approved Bedouin fashion. It’s done like this. They build a big fire, allow it to burn out, and then scrape the loose sand and ashes back to make a hole a few inches deep. A flat cake, a foot wide and three inches thick, made of coarse brown flour and water is placed in the hole and covered with hot sand and coals. When it is ready they scrape back the sand and coals, retrieve the loaf and beat it with a green stick to knock off some of the sand. They break it up in a pan, sprinkle it with sugar, add a little water, pour ghee, a kind of clarified butter, all over it and knead the result vigorously. It tasted pretty good though the ghee tasted a bit old. That night we camped near Ain Muhibbi, an interesting place only because its true location is 100 miles away from its position on the maps we have. The oil at Abu Hadriya means a great deal, as we have several similar structures from which we can now expect a 50-50 chance of getting oil. Before this we had no idea of their significance as possible oil producers. Now the company will start drilling another structure at a place called Abqaiq, halfway between Dhahran and Hofuf, on the edge of a great belt of sand dunes. Max has been all his life looking for a place like this and now he’ll soon find out if he’s right. This is going to be a great oil company and a good place to make a future. The other day, Khamis and I went up to the boundary of the Kuwait Neutral Zone to look for Ain al-Abd. This was the same well I was looking for when I met the Bedu with the porcelain pot on his head. We went straight from here going from jabal to jabal and from sand hill to sand hill. At last, Khamis said, "There it is. Those bushes are our destination." The bushes were about 10 miles away, so I asked him, "Are those bushes near the well?" He replied that they were right at the well, so we drove over to them and the well was right there. It was a big well, bubbling with sulfur gas. It sounded like an airplane and smelled worse than rotten eggs. A beautiful, clear, blue stream flows away from it to the coast 40 miles away. Lots of little minnows in the stream reminded me of happier lands, but the water is so salty and bitter the camels won’t even drink it. After we left the well, Khamis said he had never been there before. I asked him if that was the case how did he know where it was? Pointing to a couple of sand hills twelve miles away he said, "Do you see that hill over there? Do you see that one over there? One day I was on the first hill and a man told me that Ain al-Abd was this side of the other sand hill." It is very simple. You have someone point out a sand hill about 15 miles away and then you return some years later and recognize a round, low, sand hill by approaching it from the opposite side and, of course, anyone would know where the well was.